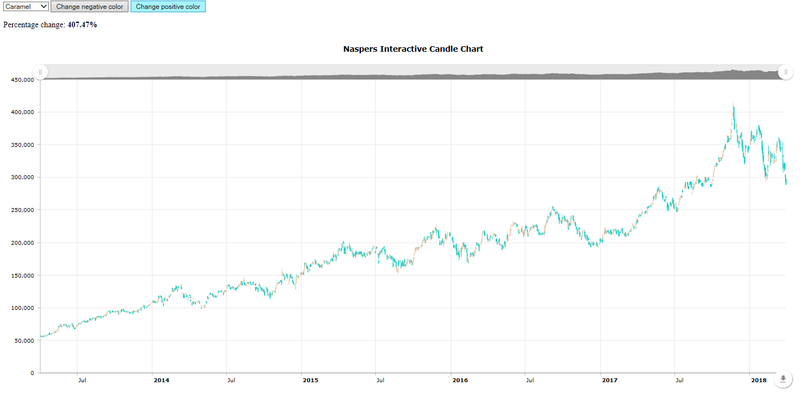 In today's blog we take a look at former market darling Naspers (NPN) and its stunning share price decline experienced over the last couple of months. It share price has been hit due to supposed dodged dealings of Naspers in South Africa, as most dodgy dealings it seems linked to the Gupta's. The dealings with the Gupta's relate to a R25mil payment made by MultiChoice to the Gupta's Infinity Media Networks. In addition to this Naspers announced that it is to sell as much as 2% of their Tencent stake, which could net Naspers around $11billion. So the Naspers (NPN) nose dive.. 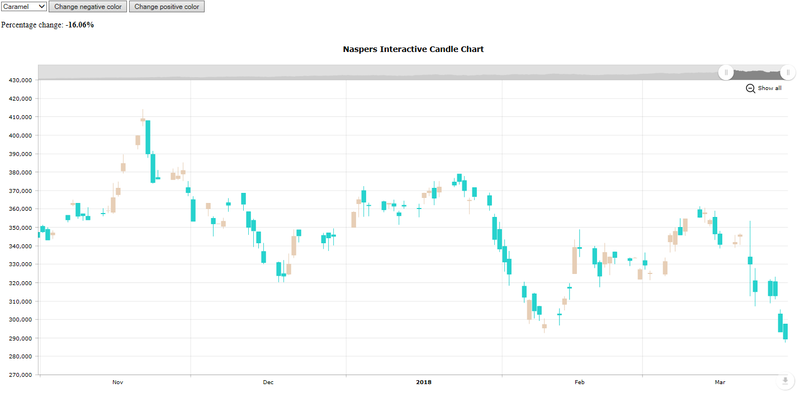 The interactive candle stick chart shows the severity with which Naspers share price has been declining in recent months. Dashing the dreams and hopes of a lot people dreaming about Naspers hitting R5000 (a hastag #NPN5000) was even started on Twitter to celebrate the arrival of NPN at R5000 a share should it get there. While the graphic above shows astronomical growth over the last 5 years, with the Naspers share price increasing by a massive 407.47% over this time period, the returns over the last 6months has been less than stellar. 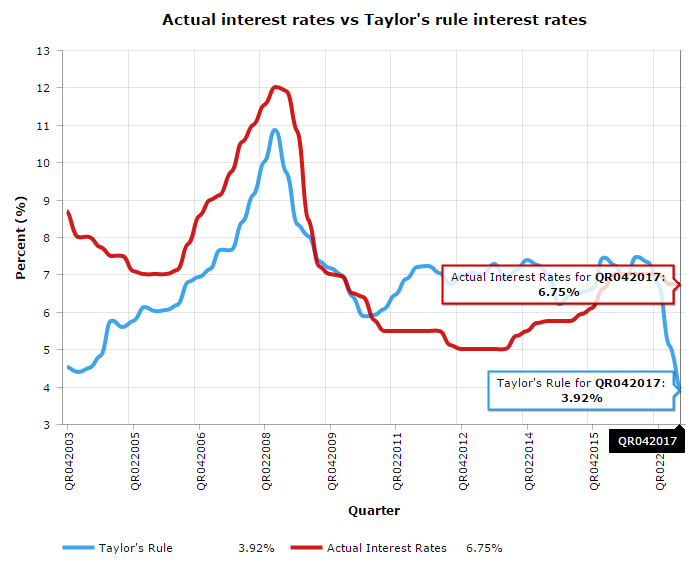 The images below shows the share price return over the last 5 years as well over the last 5months. While the share price gains of Naspers over the last 5 years have brought returns over well over 400%, over the last 5months however Naspers shares has declined by almost 17%. And with this, and the wieght Naspers carries on the JSE, it has dragged the overall market (JSE All Share Index) down with it. The interactive chart below shows the share price history of the JSE All Share Index over the last 5 odd years, and as can be seen from it the declines as experienced and shown above for Naspers can definitely be seen in the performance of the overall market in South Africa. While the graphs look pretty similar it is clear that the magnitude of the movements are very different between that of Naspers and the JSE All Share Index. This is largely due to the fact that there is around 400 other shares that makes up the All Share Index and their movements, be it up or down, smooths out the returns of the ALSI compared to that of Naspers, but there is no denying that the trends between Naspers and the ALSI are very similar. The images below shows the 5 year return of the JSE ALSI and the 5months return, and again the graphs between Naspers and the ALSI look very similar, even though the returns and declines of the ALSI is less than that of Naspers, due to reasons mentioned earlier. While investors might be punishing Naspers shares for selling a large chunk of Tencent, or because they got involved in suspect dealings with the Gupta's, one has to wonder what Naspers has up their sleeve if they want to sell a fair chunk of their most successful investment. What are they planning to do with the $11billion odd they are set to get from selling a 2% stake in Tencent? Interesting times ahead for Naspers, its CEO Koos Bekker and Naspers investors.